What is a Guild Hierarchy? A Guild Hierarchy is basically a ranking system for your guild members. You choose your guild's hierarchy when you first create your guild, and you can edit it by going trough 'Guild Layout' in the Admin panel thereafter. There are two distinct sections to the guild hierarchy - Council and general Members. Within each section there are five possible ranks. When a new member joins your guild they are automatically placed in Member Rank 5 position. After that, an Administrator has to manually edit members for them to move up the ranks. The most successful guilds use these Member ranks in one of two ways - as a series of attainable levels for their members move through or as a way to assign their members into usergroups. Each has its own pros and cons, and it really depends on the theme and style of your guild as to which works better for you. Using the hierarchy as a series of attainable levels is by far the most popular method, and a great many successful guilds are set up this way. Generally, it is a good idea to set some guidelines for your members, so that they have something to aim for. Organised in this way ranks encourage activeness in your guild, as members will be trying to move up to the next level. For example, if you specify that the only way to move up is to make x number of posts on the guild board then this will encourage members to post and discuss things in order to progress. The only thing that you must watch out for is specifying that members must donate x amount of Neopoints or items to progress - while guilds are allowed to take donations, having a requirement like that is against the rules and you risk your account if you do so. "Look - I'm moving up in the world!" Becoming increasingly more popular is the idea of using the hierarchy to assign members into different usergroups. This idea originally started within specialty guilds, particularly Harry Potter themed guilds, where members are assigned to one of the four houses (and the default rank set to "Unsorted" or something similar), but is now found in a wide range of different guilds where teams of members compete against each other for points or some such thing. Activity is encouraged as members work to beat the other teams. Members may be given the option to choose their group, or they may be assigned via a quiz or test. How do members change ranks? While it might be nice to be able to set rank change to specific post counts within your board the only way for members to change rank is for you, or another member with Member Admin privileges, to change their ranks in the Guild Members admin panel. Select the member and change their rank in the dropdown menu. But what about the Council? Council ranks work slightly differently. 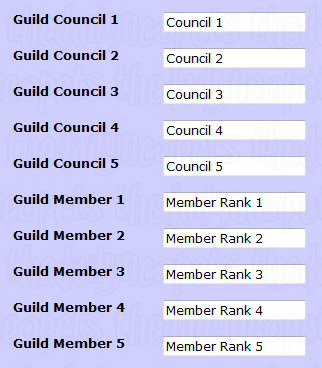 Only one user in the whole guild may occupy each of these five ranks, and their usernames are displayed in the Council box at the top of the guild navbar. As the guild Leader, you will automatically be in the first Council position. Only the elite members of your guild should be awarded with a Council position. This would mean that they are very important, and trustworthy. Usually, Council members have some form of Admin powers, to help you update and maintain your guild. They should have a say in what goes on so that your guild may continue to be successful. When you first set up your guild you should consider when you will choose the members for your Council. Unless you're setting up the guild with another user ("co-owners") it is recommended that you don't just select the first people to join your guild, or those that ask - an open Council in a small guild looks good to potential new members. It shows that, if they are active, then they have a chance to be on the Council, which is seen as a very privileged position despite the work involved. A general rule of thumb is to chose your fifth (and lowest) council member when you reach around 25 members, your fourth at 50 members, third at 75 and the final second-in-command at 100 members. This helps to keep people motivated to join, even as your guild gets larger and larger. "Only the very best make it to the guild Council you know!" What's the point? Can't I just leave them as default? Well, yes - you could. Its just rather... boring. Simply because of the sheer number of guilds in Neopia, any new guild needs something to set it apart in potential member's eyes. A well-implemented hierarchy can do this - even apart from the aforementioned benefits to member activity. Guild ranks also appear everywhere within your guild - on your member's lookups, on the navbar when they're signed in, and in the member list - so its much neater if you have a system of ranking that works and looks nice. "Aren't sensible ranks just that much prettier?"